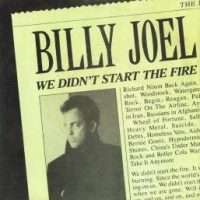 “We Didn’t Start the Fire” was a huge commercial success when it was released in 1989. It was Billy Joel’s third Billboard No. 1 hit and was nominated for the Grammy Award for Record of the Year. It’s also a great summary of history for the second half of the 20th Century. Its lyrics include brief, rapid-fire allusions to more than 100 headline events between January 1949 (Billy Joel was born on May 9 of that year) and 1989, when the song was released on his album Storm Front. Joel has mixed feelings about the song. “It’s a nightmare to perform live, because if I miss one word, it’s a train wreck.” He has also called it a “novelty song” that does not “really define me as well as album songs that probably don’t get played”. Several of the events and people mentioned in the song are also subjects — in one way or another– of Moments in U.S. Diplomatic History so we thought it would be fun to combine the two. (Some pieces are more appropriate than others but humor us.) We will continue to add in new links as we get relevant Moments. Song copyright by Joelsongs; cover art copyright by Columbia Records. Go here to watch the video.